"So I says to the Admiral....."
"Dammit, I don't see why." "Do I hafta get a haircut right now, John?" "Now, Commander, about those 600 landings"
"I can't help it if I'm always happy." "Captain, there's just one thing I'd like to bring up." "Can Jim's division use all recognition lights?" "Where did you guys rendezvous this morning?" "Know him? Why I shaved his father." "Now the way we done it aboard ship." "Boy, if my Grandaddy could see me now." "They looked just like FM's 'till I joined up." "John, I says, this is no place for you." "So I said, 'That's my coconut - sir'." "You'd be surprised how much you learn about planes working on them like this." "If it hadn't been for South Carolina, we'd won the War." "Boogie at 1 o'clock up, 10 1/2 miles, angels 6.3." "You don't get what I mean." "I have scarcely been in the sack all day." "Well, it's not exactly a tavern." * Member of the "Rover Boys" who joined VC-27 in early November. "It is easier with your eyes open." "We have a little club like this back in Ohio"
"It'll be something to have the first boy in the squadron." "I would like to ask one question"
"Have you ever been in Sloppy Joe's in Hongkong?" "Horizontal, but a goin' Jessie!" "I have only one objection-"
"What time we leaving for Palm Springs tonight, Doug?" "Now in the old Navy-"
"I believe the L.S.O. - most of the time." "Do you want my autograph?" "Does everyone have his shackle?" "You can't buck City Hall." "The first thing I'm going to do when we hit the states is . . ."
"When I was down on the Canal"
* TBM pilots were assigned to "squads" of four planes. Each squad had a squad leader. These are noted where known. 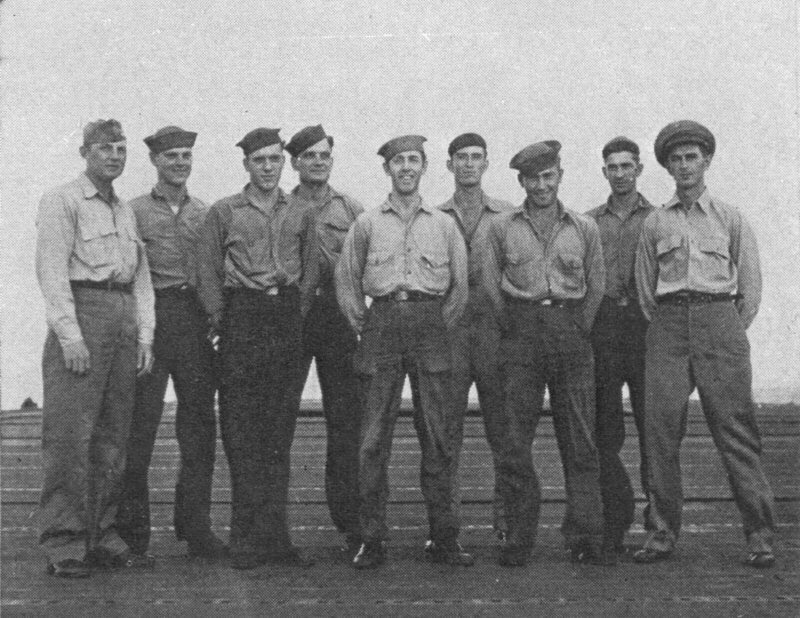 Left to right, front row: H. C. Larsen, AOM 2/c; Russell H. Ripley, AOM 2/c; D. H. Simons, AOM 3/c; Lloyd J. LeBlanc, AOM 1/c; Floyd G. Norman, AMM 2/c; R. F. Phillips, AOM 2/c; Wilfred J. Luecht, AOM 2/c; G. A. Lewis, AOM 2/c. Back row: L. C. Weimer, AOM 1/c; W. W. Perkins, AOM 3/c; R. L. Morrison, AOM 2/c; Toby A. Turpen, AOM 1/c; Noel J. Bussey, AMM 2/c; C. Jacobsen, AOM 1/c; D. M. Sawyer, AMM 3/c; Harold E. Roache, AMM 2/c; Jack E. Scholl, AMM 2/c. Left to right, front row: R. J. McCray, ARM 3/c; Worley C. Spain, ARM 3/c; A. A. Wilson, ARM 1/c; R. Snider, ACRM; Jimmie W. Dunn, ARM 1/c, Francis E. Daly, ARM 2/3; G. H. Turner, ARM, 3/c; R. D. Heiling, ARM 3/c. 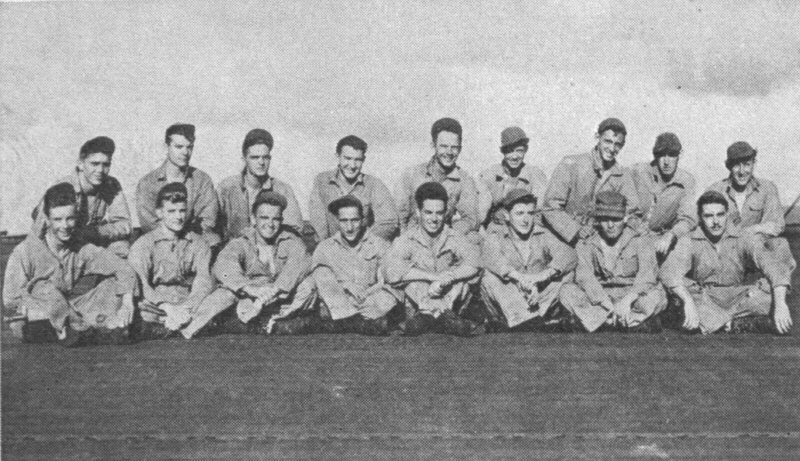 Back row: Roy G. Eshelman, ARM 3/c; S. C. Jones, ARM 2/c; Wesley W. Hill, ARM 2/c; William Patrick Simmons, ARM 3/c; R. E. Dobyns, ARM 1/c; Philip J. Yoder, ARM 3/c; Lionel Arceneaux, ARM 2/c; Harry R. Johnson, ARM 3/c; G. W. Blessinger, ARM 3/c; C. S. Hogan, ARM 3/c. Left to right: Nickolas E. Spies, ACMM; J. J. Trenka, AEM 1/c; J. T. Jackson, AMM 1/c; W. J. Pickett, PR 1/c; P. C. Warner, Y 2/c; G. A. Dalton, AMM 1/c; W. S. Sinkiewicz, AMM 1/c, P. H. Walker, ART 1/c; William A. Moye, ACOM. 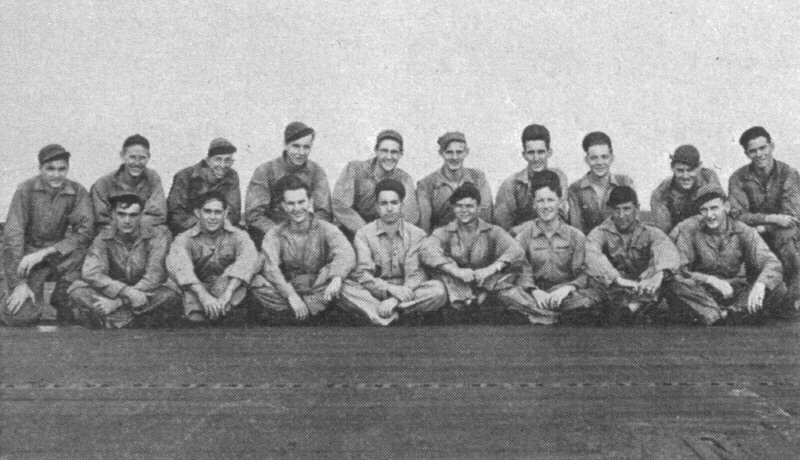 Most of the initial members of the Ground Crew were later assigned to the U.S.S. Savo Island. "I'm sure it was O.K. when he took off, Commander." "Well, fellows, you're flying the planes, all I can do is throw you some signals." "I'll load 'em, you drop 'em, and we'll all go home." "Well, I'll need four volunteers." "Cut him high and fast, Dif, I'm running low." Lt August C. Miller, Jr.
"This is it men. Are pilots ready?" "See Warner, he'll fix you up." "My kingdom for a tree."